Sophie Taeuber: Sans titre, ca. 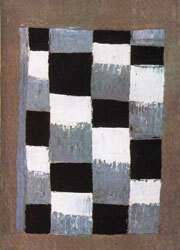 1916-1917; Composition verticale horizontale, ca. 1916-1918. 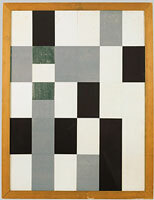 Jean Arp: Papiers coupés au massicot, 1918. Arp 1886-1966. Exhibition Catalogue Württembergischer Kunstverein, Stuttgart, 1986, pp. 52-55. Paul Klee: Einst dem Grau der Nacht enttaucht ..., 1918; Alter Klang, 1925; Farbtafel auf maiorem Grau, 1930; Individualisierte Höhenmessung der Lagen, 1930; Paneelschildering QU I, 1930; Polyphonie, 1932. 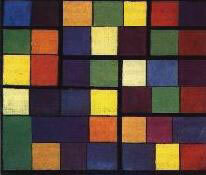 Jürg Spiller: Paul Klee. Utrecht: Bruna, 1962, pp. 61/83. 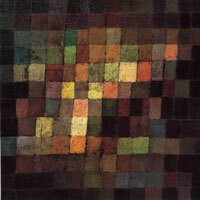 Norbert Lynton: Klee. London: Hamlyn, 1964. "Hij zet nu met zijn Belgisch intellect een hulpstelsel op touw dat volgens mij op de natuur gebaseerd is. (...) Met zijn gewone bewustzijn zit hij alles uit te rekenen. (...) Hij gaat te werk als een (gewone) theosoof." 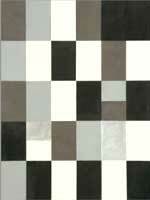 [Mondriaan writing to Van Doesburg, September 5, 1920.] Cf. Nicolette Gast: "Georges Vantongerloo." 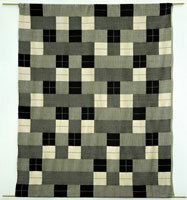 In: De beginjaren van De Stijl 1917-1922. 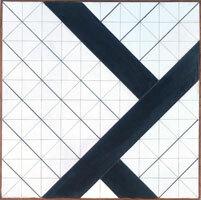 Utrecht: Reflex, 1982, pp. 233-261. "De machine houdt niet de nieuwe cultuur in. (. . .) De machine veralgemeent, zoals het militarisme veralgemeent. Het kan het individueele verminderen -- het kan het ook dooden." 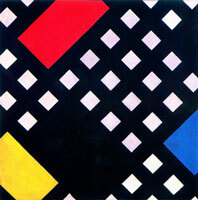 Piet Mondriaan: "De Jazz en de Neo-plastiek." 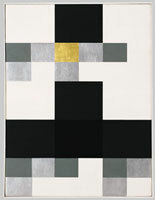 In: Yve-Alain Bois: Arthur Lehning en Mondriaan. Amsterdam: Van Gennep, 1984, pp. 89/90.
" Order can serve as a metaphor for order." Gombrich: The Sense of Order, p. 247. Note that for Gombrich the notion of "order" has a positive charge: harmony, equilibrium, everything in its proper place. Since Ludwig Boltzmann, however, this Aristotelean notion has lost its validity. Today, order is forced, authoritarian, militaristic. "In the early part of this century there began to appear, first in France and then in Russia and in Holland, a structure that has remained emblematic of the modernist ambition in the visual arts ever since. Surfacing in pre-War cubist painting and subsequently becoming ever more stringent and manifest, the grid announces, among other things, modern art's will to silence, its hostility to literature, to narrative, to discourse." "It is not just the sheer number of careers that have been devoted to the exploration of the grid that is impressive, but the fact that never could exploration have chosen less fertile ground. 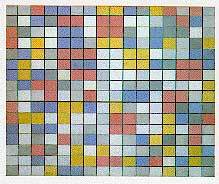 As the experience of Mondrian amply demonstrates, development is precisely what the grid resists. But no one seems to have been deterred by that example, and modernist practice continues to generate ever more instances of grids." "In the spatial sense, the grid states the autonomy of the realm of art. Flattened, geometricized, ordered, it is antinatural, antimimetic, antireal. It is what art looks like when it turns its back to nature. In the flatness that results from its coordinates, the grid is the means of crowding out the dimensions of the real and replacing them with the lateral result not of imitation, but of aesthetic decree. Insofar as its order is that of pure relationship, the grid is a way of abrogating the claims of natural objects to have an order particular to themselves; the relationships in the aesthetic field are shown by the grid to be in a world apart and, with respect to natural objects, to be both prior and final." ". . . the bottom line of the grid is a naked and determined materialism. But (. . .) that is not the way that artists have ever discussed it. (. 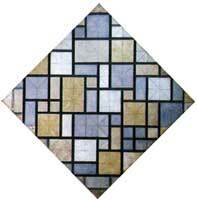 . .) Mondrian and Malevich are not discussing canvas or pigment or graphite or any other form of matter. They are talking about Being or Mind or Spirit." "The grid's mythic power is that it makes us able to think we are dealing with materialism (or sometimes science, or logic) while at the same time it provides us with a release into belief (or illusion, or fiction)." "It's supposed to be indexical of all that is rational, but I think it's as mad as many logical things turn out to be  artificial, hysterical, subsuming its own version of chaos. It's rigid but flexible, a measure of scale but scaleless, it's flat with imitations of depth, democratic about space but really absolutist, stamped with rigidity but alert with permutational virtuosity. It's a container that contains itself, that is both form and content." The Centrifugal Grid versus the Centripetal Grid. David Sylvester: "Mondrian in London," Studio International, December 1966.